Android founder Andy Rubin's Essential Phone remains a somewhat niche device, but Essential has remained committed to supporting their vision of an expertly designed smartphone with its own distinct personality. Now, the Essential Phone PH-1 is available in a new color, Ocean Depths. The Essential Phone is still struggling to be a commercial hit, but Andy Rubin and co. are still pushing their vision of a phone that stands out from the crowd. At a time when many manufacturers are pushing romantic red versions of their handsets, the Essential Phone PH-1 is coming out in...blue. To be more precise, it's a blue-green color dubbed Ocean Depths, which was teased on Essential's Twitter account. As indicated above, the new color variant should be available from February 15. It's worth noting that this Ocean Depths color was advertised as part of the Essential Phone lineup last year, but when it launched in July 2017, you could only get it in Pure White and Black Moon. That leaves a fourth advertised color, Stellar Gray, which is yet to be seen. Perhaps it's not far down the line now. Essential seems to be backing their vision to the hilt, supporting their original model for the long haul rather than rushing a new generation. Given the possibility of more mods and color variants this year (and the hope of better carrier support from fans), perhaps a long-term strategy will work out for Essential. For now at least, the Ocean Depths color is a refreshing break from the red trend of the moment. Anyone tempted for a dip in the ocean? Andy Rubin was the Senior Vice President of Google’s mobile sector up until 2014. His successor was Sundar Pichai, now the CEO of Google, who was then succeeded in turn by Hiroshi Lockheimer. Rubin was the Android inventor and under his leadership, the OS was installed on billions of devices. Later, he got into robotics at Google, but soon left this area as well to pursue his own interests. After 2014, Andy Rubin began to work intensely with young startups and, under his tutelage, Playground Global found worldwide success. The focus of the company was on artificial intelligence, robotics and augmented reality. Now, it would like to integrate the innovations that it was able to achieve in a new smartphone, as recently reported by Bloomberg. With the support of a team of 40 people, made up of former Apple and Google employees, the Android founder has now started a new company called Essential. Essential has ambitions to produce not only smartphones but also smart home hardware, with the high-end smartphone at the center of the ecosystem. The high-end Essential phone cost $699 to pre-order on Essential's website when it was released, and now it's a full $200 cheaper. It's selling on Essential's website now for $499. Those who have already bought an Essential Phone won't be left hanging, as they will receive a coupon worth $200 which can be used to buy a 360-degree camera or an additional Essential Phone. The Essential phone is only available in the US for now. An international release will be announced in the future. The technical specs alone won't be a massive surprise to many. But if we take a closer look, the Essential phone does seem to pack in a few surprises. First of all, it's worth noting that the manufacturer attempted to get as much display on the front as possible. The body-to-display ration seems to be quite high. If we have a look at the upper segment of the display, we spot a very narrow frame, but within that frame, we can still see an integrated selfie cam (that explains that "incursion" at the top in the middle). Andy Rubin graced us with another highlight - a magnetic connector, which Essential wants to make use off to build up its own accessory ecosystem. The first two accessories that Essential has lined up will be the aforementioned 360 camera and a magnetic charger. 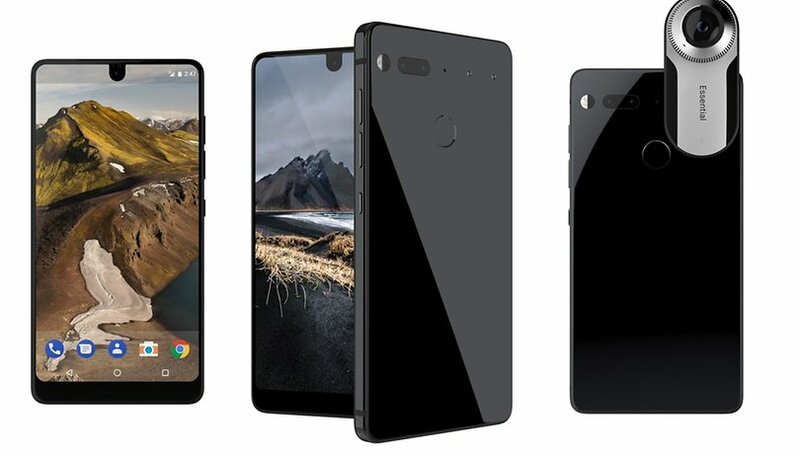 Concerning the design and build, Essential has decided to be a bit more exclusive. The Essential phone is made of ceramic and titanium, which makes it quite durable and shock resistant. Unfortunately, it seems that the designers also left out a headphone jack. Yazhu Ling, ‎Lead Image Quality Engineer at Essential, described the details of the main camera of the new Essential Phone in a post to the company blog. The two main things the firm wanted to accomplish with the camera were avoiding an unsightly camera bump and focusing on capturing quality low-light photos. The dual rear camera of the PH-1 has one monochrome and one RGB lens. When images taken with each are combined, the result is a better exposed image with less noise. Though it's been the subject of much criticism, further updates to the camera's software have led to better results. Let us know what you think about the Essential Phone in the comments! I bought at release and sent it back. Fast forward.... I bought it at the cheaper price and it is most definitely the best phone I've owned. now priced at $499! with those specs and design probably the best value smartphone ever.. I just placed my order $699 total for the black variant, should have it within one week. The Note will be $1100-$1200 with tax, and it will be full of bloatware and Samlag, I should know, had the S3, S4, Note 4 and using the S7 now, and forget about timely updates, my S7 is still running 7.0 which was just recently updated to by Samsung. The essential is costing me $699 total. They also have a 15 day return policy. Just another very good "flagship" phone, that will be cannibalized for any incremental improvements to the current stable of Apple, Samsung, LG, etc. devices. These are very "in" people who have had a couple of years to review the major players and come up with a stunning alternative and this is it. The most telling thing is how little there is left to do with the hardware "essentials" of the commodity smartphone, that is already much more functional than what 90% of users even know what to do with. There is still no use in encrusting the case with rubies and diamonds because the operating system will be out of date in a couple of years (so much for the $17,000 Apple Watch Edition that is now the badge of a capital I fanbois Idiot). I look for some stabilization of software internals that will let smartphone flagships generate real money like the Rolex, Movado, Breitling watches that are pure conspicuous consumption jewelry, without any pretense of better functionality. For a first time release, a world premier I think the price is very high 700.00. A ceramic built phone another first. No headphone jack. What about micro s/d expansion? To me this is a questionable offering! I think for a high quality phone with premium specs with premium build materials and 128GB of high speed storage for $699 is a good price. I really really want to like and buy this phone. I have emailed a couple of questions to Essential and received sketchy responses. I currently own 4 original Droid Turbos, family plan on Verizon, and we love them especially for the large battery. The battery in the Essential is much smaller and I'm concerned on how long before recharging. The response from Essential was that they have no information on battery charge life. My second question is about the ceramic back. Ceramic is an insulator, so heat is a concern for me. Also, ceramic is notoriously brittle. Ceramics may be a great heat shield for the space shuttle, but drop one of the tiles and it breaks into many pieces. After doing some research on ceramics, there are some versions that are far more durable, but Essential only referred me to their website info on the construction. Lastly, their titanium edge is forged, not milled. While titanium is extremely hard as any golfer will tell you, forged titanium is slightly porous. That leads me to wonder if there's any water resistance at all. Having fallen into a lake with my Turbo in my pocket, while not a regular occurrence, is still a big concern for me, especially at $700. I really want to like this phone, and I guess I'll wait for actual reviews before purchasing. The Droid Z Force is not an option. The add-ons are far too large to be practical. I've dreamed of a Titanium phone for years, having gotten acquainted with the metal when Titanium hit the pro and hi-end bicycle market. Once manufactured, the stuff - whether in frames, components or whatever, is very difficult to bend or deform and would be perfect for shrugging off drops that would bend other materials...if the right alloy is chosen. I hope they release a stone washed finish that lets the natural color show. It also appears that Andy may release a second version of Glass. With a 6GBs wireless link to the 360 camera already done it would seem that offloading the AR, video and data processing via that link from the Glass v.2 to the smartphone might work well and help eliminate the video bandwidth issues the original Glass had. It's great to see new smartphone brands coming in to the mix with smartphones that can challenge the S8,HTC U11,LG G6.This is their first phone imagine what their second smartphone will be like! The phone is built like a tank, with materials never used in any other phone to date, it comes with the latest hardware, pure stock Android and 7.1.1 out of the box "this is not I have another Samsung phone", a fantastic edge to edge screen with no idiotic curved glass screen, it's 10mm shorter and 5mm narrower than the HTC U11 with a bigger screen. If you are looking for another Chinese/Korean phone made of fragile glass then you have plenty of options to choose from, this phone is different, premium materials without all the garbage that these other manufacturers throw in. Here is the Recode conference with Andy Rubin and Essential and the PH-1 which Walt "the Apple shill" screwed up, but that's another story for another day. I can not post links, so you need to go to YouTube and look up Recode to find the conference with Andy Rubin and Essential. If it had wireless charging I might give it a shot. If it had wireless charging and water resistance I would have already pre-ordered one. I'll hold off for now. Those features definitely should have been included , for $699. Wireless charging, a big loss(if he wants to make ai a big deal, he could have introduced a smart charger function). Water immunity, is nice to have too, but isn't really necessary for me(I said me, not everybody, so no flack). I really take extreme care of my phone, and anything over $400, I show respect for, so water protection is up to me(None of my phones ever got wet). The selfie camera placement isn't a big deal for me, but it should have been put under glass. The flush design is done well though.